International Tabletop Day is an initiative of Geek & Sundry and is a day to celebrate board gaming! G&S will be streaming board game plays live all day on various channels like YouTube and Twitch and throughout the world, events are organized where people can come together to play games. You can download a print-friendly .PDF file here or the *.PNG file here. On April 28th, we’ll also be announcing the winners of our giveaways on our social media channels! If you have no clue what I’m talking about, you might want to check out our Facebook, Instagram and Twitter account to check it out. We’re giving away a signed notebook, a shirt and a tote bag from our merchandise store we’ve opened last week. Also, a little reminder that our 10% sale on everything will end tomorrow on April 24th. 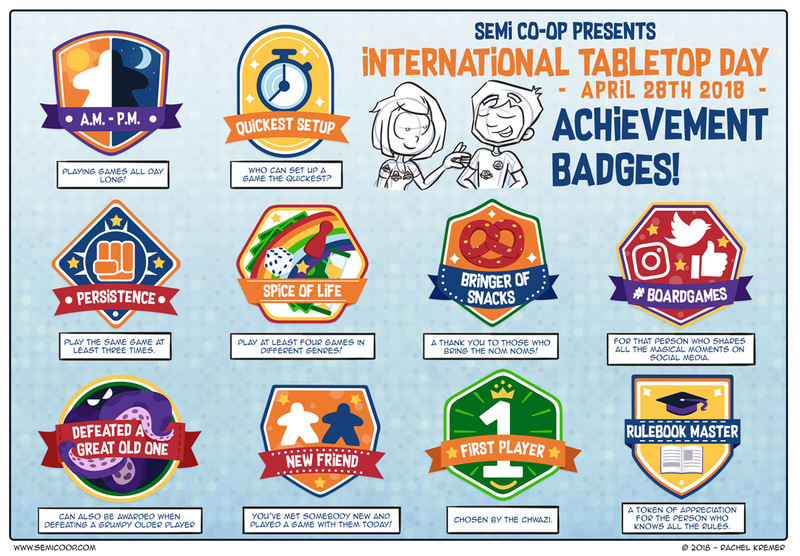 What achievement badges should we make for Tabletop Day 2019? Great idea! Will print and use. Yes, these are great ideas! 😀 I’ll write them down for next year. Traveler – attend more than one event on Tabletop Day. Aiming for 3 and it is going to be pouring outside! Thanks for the badges, they went down a treat; with some people actually aiming to acquire them.